Pictures from the 2003 Team Challenge sportbike motorcycle race at Daytona International Speedway in Florida. Each year, the legendary Bike Week event is held in Daytona Florida. A variety of races and events take place at the Daytona International Speedway including AMA, CCS, WERA and AHRMA (American Historic Racing Motorcycle Association) races. 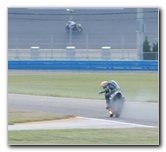 These particular pictures are from the Daytona Team Challenge sportbike motorcycle race that occurred in 2003. A friend of a friend was the # 477 racer, so we both went to check out the race. We drove from Gainesville Florida where we attended the University of Florida down to Daytona Beach for the day. For the photography enthusiasts out there, these pictures were taken with a Nikon D100 6.3 megapixel digital SLR camera body and a Tamron 28-300mm zoom lens. I wish there had been more sunlight on the day that I took these images so that I could have taken sharper pictures.